Simone Biles’ golden run in Rio is picking up steam. The 19-year-old superstar added a third gold medal to her haul Sunday, easily capturing the women’s vault final. Biles, who helped the “Final Five” to team gold and dominated the all-around competition last week, averaged 15.966 on her two vaults Sunday to become the first American woman to win the event at the Olympics. Russia’s Maria Paseka edged Switzerland’s Giulia Steingruber for silver, more than 0.7 behind Biles, showcasing the gap between Biles and the rest of the world. August 11, 2016 – Rio de Janeiro, RJ, Brazil – USA’s Simone BILES launches herself on the vault during the Women’s Individual All-Around Final Thursday at the 2016 Rio Summer Olympics. Going last among the eight female finalists, Biles drilled her Amanar — a round-off onto the block followed by two-plus twists — and put up a 15.9 to take the lead. 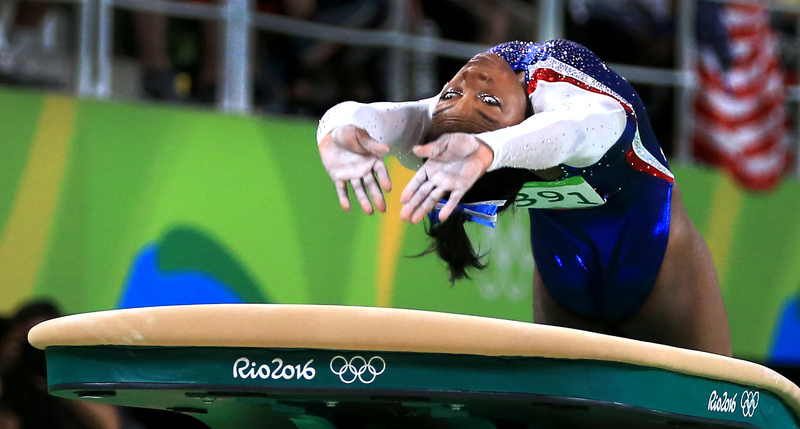 Needing only to land her second vault to win, Biles was near perfect. Her score of 16.033 for her Cheng was the best of the night. Biles’ three golds in Rio are the most by a female gymnast from the U.S. in one Olympics. She will get a chance to grab even more gold when she competes in the uneven bars and floor exercise finals later this week.